They are totally different from most of the other construction toys you may be aware of. They have a great size: Benni got his first set when he was about 18 months old. And we could play with it right away. The individual elements automatically align and snap together. They don’t require any force or alignment to put together. That’s a huge benefit for young kids! Your existing SmartMax collection grows as your kid grows: Just like Lego (or Duplo, which we’ll discuss below 🙂 ) you can buy expansion sets, and all SmartMax elements work together. What’s pretty cool is that you can start with a very low priced starter set, see if you and your kid like it and then expand on it with an expansion set. Or you go all in and get SmartMax Build XXL Set right away. Your call! This one is kind of a must-have, I believe. 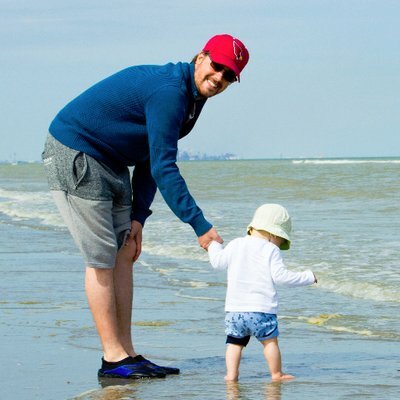 Especially for dads and who want something they enjoy playing together with their sons (but I would totally suggest this for girls and moms as well; read more about this down below on #3, where I’m gonna tell you a bit more about Benni’s kitchen). Workbenches to play with come in all different colors, shapes, sizes and materials. Benni’s workbench is a wooden one that we just recently picked up from a yard sale. It came with tons of accessories: Wooden screws, nuts, tools etc. and that adds tons of value. So far, Benni’s room mainly was his bedroom. During daytime, Benni would usually join us in the living room and we would play here. But since we have added a toy workbench to his room we spend a lot more time there playing. 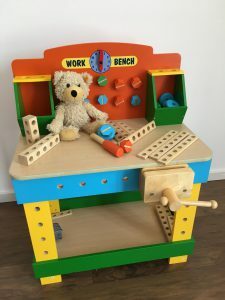 I have pre-selected a variety of different workbenches below you can get for your kid. It’s completely up to you: They are all great and differ in style, material and size. Get the one YOU like, and your enthusiasm will carry over to your child. He/she will love it. Trust me! No matter which one you get, make sure to get a wooden construction set like the Melissa & Doug Wooden Construction Building Set or this beautiful tool set, that also comes with construction elements. Oh, and don’t forget to also purchase a set of batteries: You’ll need 6 AA batteries. I always suggest getting a Panasonic Eneloop 8-Pack. They perform as good as regular batteries, but you can recharge them and use them over and over again. Oh, and they come pre-charged, so you can use them out of the box. If you don’t have a charger already, you can get one bundled with the Eneloops. Name two things that every boy loves! Wooden toys and trains, maybe!? No, totally! BRIO Railway Sets are total winners, and there is no way around it. Benni was 18 months old when I turned the BRIO Farm Railway Set into his first advent calendar. And even though I’m pretty sure that back then I enjoyed it more than he did, today he really loves his BRIO trains. He takes them out multiple times a week, and just today he built a huge track together with his grandpa. It’s really a toy that connects generations! The wooden tracks, trains and accessories are of very high quality and are highly durable. The size is so that kids under three cannot swallow them, yet still detailed enough to please us as moms and dads as well. And if you’re like me, you quickly want to add some electricity, right? No problem: BRIO offers electric locomotives as well. 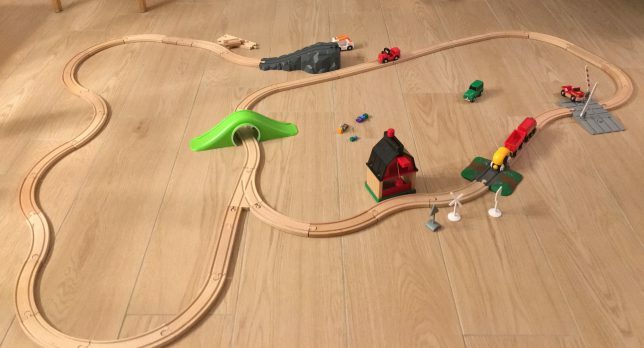 And there are many third-party suppliers that provide accessories (like tracks, trains, buildings and the like) that can easily be combined with any BRIO set. Okay, I get it! That sounds strange and may come to your surprise. But hear me out: Benni loves our Carrera Race Track! Here’s the thing: Kids love toy cars. At the age of three, it doesn’t matter if it’s a boy or girl (just like boys can play with dolls), they simply enjoy them. And if they move by themselves, that makes them just more exciting. Now you may say: Yes, but how can my 3-year-old drive a slot car? It’s way to fast! I’ll elaborate on that on a separate blog post, but the short answer is: If you get the right system, this works out very well: We own a Carrera 132 Digital, which allows you to reduce the car’s speed to an extent where they simply won’t “deslot” (or fly out of corners). It works very well. Now, with almost three years, Benni knows the system so well that he goes into the room where our race track is installed, turns it on by himself and just drives. That’s pretty impressive, isn’t it? If the 300-Dollar digital version is too much for me, there are much cheaper sets like the Mario Kart Set, for example. You may consider them more appealing to kids but bear in mind that they do not offer that “slow down” feature I explained above. Hence, I suggest paying a bit more, get the more “adult” set: It works better for small kids! Just know that you will need some space for this toy! For some people that’s a show stopper for sure. 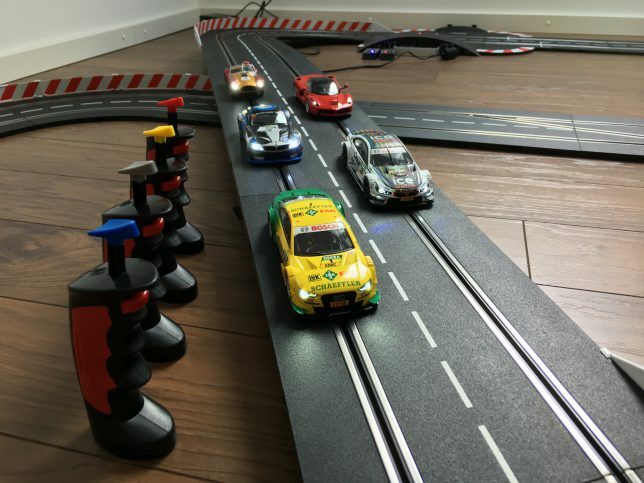 If you want to learn more, please read my full review of Carrera Slot Car Sets here! At the age of three, kids are at a stage where they are capable of understanding and playing basic “rule-based” games, like simple board or card games. Orchard is an amazing, super fun game for the entire family to familiarize your kid with rules in games. And it’s cooperative, which helps your kid get a feeling for winning and losing TOGETHER, rather than being better or worse than other players. You, the players, throw a dice to collect fruit from the orchard before the crow comes and takes it away. If the players collect all the fruit, the entire family wins. If not, the crow wins and you start all over. The game is beautifully illustrated and the game material is high quality painted wood. I highly recommend Orchard if you want to start playing games by rules together with your kid. Benni LOVES it! If your kid is younger than two, you may consider getting First Orchard, which is a bit easier and faster to play. Also, the material is bigger, hence easier to hold and harder to swallow and therefore much safer! Lego Duplo Sets are great for three years old and I cannot think of a single set that would not be a winner when given to a child! The plastic is high quality and the possibilities are endless. When starting out I would probably recommend getting the LEGO DUPLO Town Truck & Tracked Excavator. I yet have to meet a single child that is not totally excited about excavators at that age, and hence I am absolutely certain that your kid will love this set. The only downside I noticed after an entire year of heavy usage is that the excavator’s joints tend to get a bit loose. But taking into account that this set is less than 15 bucks, we had (and are still having) tons of playtime (and fun) with this toy. I’d recommend it without a doubt. When I was writing about the Workbench above I already tried to get those old role models out of the way: That boys play with cars and tools, and girls play with dolls and wear all pink clothes. That may be true for your kids and that’s fine. And while Benni definitely prefers cars over dolls, I don’t believe that it’s our job as parents to push our kids in one direction or the other. 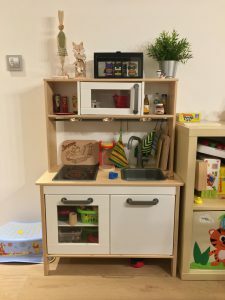 With that being out of the way, I want to point out that we gave Benni his very own play kitchen for his second birthday. He loves it to this very day because we placed inside our real kitchen. Now when mommy is preparing food in the kitchen he can either help her for real (which he loves to do) or he can prepare his own fantasy-food in his own kitchen. We decided to get IKEA’s Duktik Mini Kitchen for him. It’s made of high-quality wood and comes with battery-powered cooking plates (led lights only, obviously), “microwave” and even a plastic sink. It’s really cool and I’m sure it will last for years to come! However, make sure to also get some accessories like pans, pots and plastic food. Just like the Carrera Set I mentioned earlier, this one might surprise you. You may wonder why Lego, with all those small parts, should be something to give to a 3-year-old. So, let me put a small disclaimer here: I am NOT suggesting to give one of these sets to your kid to play with on his own. I suggest building these sets and playing with them TOGETHER with your kid. That’s where they shine! Lego Minecraft Sets aren’t designed as “collectibles” (like other sets, e.g. Lego’s Saturn V and many other Ideas sets). They are designed as PLAY sets! It doesn’t hurt when your child grabs them and takes them apart! Not a bit. Instead, it’s fun, because you know you may now put them back together. Lego Minecraft Sets consist of many of the classic 2 x 4 and 2 x 2 bricks. Where many modern Lego City or Ideas sets heavily rely on 1 x X, very “thin” bricks, Lego Minecraft Sets remind me of the Lego Sets that I had when I was a kid. They are really made for kids. They usually consist of individual “modules”. What I mean by that is that if you want to change something, you do not have to take it apart and rebuild it from scratch, but instead you can take apart the modules and then rearrange them to get a completely different experience. That’s fun! And even a 3-year-old can do that easily! So here we go: My #1 favorite toy for 3 year olds. I PROMISE you: You’re kids will love it. And you, as a parent, will love it too. 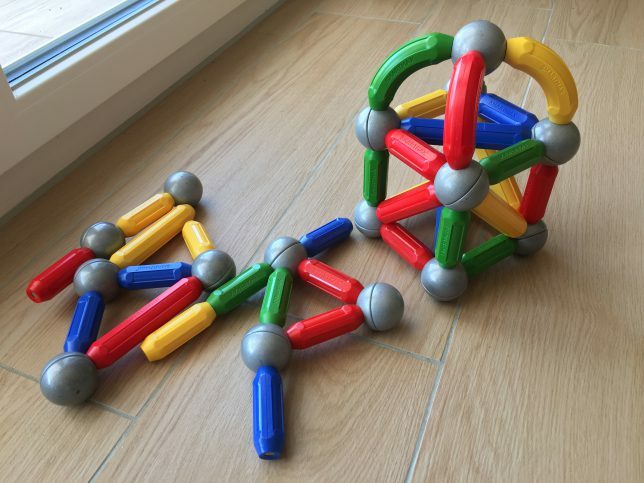 Hubelino is a Duplo-compatible marble run system. That sounds complicated, but let me explain the basics: You start by building a “base construction” with Lego Duplo bricks or the Duplo-compatible, white “construction-bricks” that you’ll get with the starter set. And then you’ll put the included marble run elements on top of that. As a result, you’ll get a highly stable, yet very versatile marble run that you can change, rebuild and extend as much as you like. Benni and I love it and we play with it almost daily! It’s really incredible and until this very day, I have no clue why Lego themselves did never release a system like that. And here’s the kicker: If you love it as much as we do, you can buy several extension sets like the 50-Piece Run Elements Expansion Set or 22-Piece Twister Expansion Set that allow you to build even longer and crazier marble runs. Once built, the marble run is super stable. If you’ve ever played with Lego Duplo bricks, you know what I am talking about. Your kid cannot simply push it over… And if your kid is a three-year-old, you know that THIS is the number 1 issue with any construction toy at that age, right? The individual bricks and marble run elements are highly durable. They are pretty much indestructible! And they are 100% Made in Germany: The plastic is high quality and free of any kind of toxic materials! The marble run is very easy to build. Your 3 year old won’t be able to build it on his own. But together with YOU he or she will be able to build amazing marble runs in no time. And if you’re out of ideas there are manuals offered for free by Hubelino where they will show you step by step how to build amazing runs! Do you already own Duplo bricks? Great! Then you’re all set! You do not even have to buy the starter set. We just bought the 50 pieces extension set and combined that with our existing Duplo brick collection. And it’s so much fun! Don’t own Duplo bricks? NO PROBLEMO: Just get the starter set as it comes with everything you need: Marble run elements AND construction bricks. The entire system is expandable. Just buy more (and probably different) marble run elements and build even bigger runs. Give it a try, especially if you already own an existing Duplo collection. It’s really special: I promise you HOURS of fun for your kids and yourself – most likely for years to come! Are you hooked? Then make sure to read my FULL REVIEW of the Hubelino Marble Run System here!!! Do you have something to add to this story? I am always eager to learn. What is your favorite toy, age recommendation, play style when playing with your kid etc? Please drop a comment below or holla at me at chris@ThatToyDad.com – I’m looking forward to your feedback! That Hubelino set looks so cool. How well does it integrate with the Duplo set? We had legos in our house, and mega blocks wouldn’t go together with them. We have always had legos in our house, and open ended toys like that are incredible. They never get old because there is always something new to create. You are only limited by your imagination. Many hours of creative fun have been spent around our lego bin! Hey Jeff! Glad you liked my article and happy I could help 🙂 Hubelino integrates very well with Duplo. It’s 100% compatible, the marble run elements have the same dimensions as regular Duplo bricks and the quality of the plastic is also really good. There are very few special bricks (besides the specific marble run elements) that are part of the starter set and that you won’t find in normal Duplo sets and make sense to own: There are some “hollow” bricks with cutouts that you can use to build small “bridges”. We don’t have them (as we don’t own the starter set) and you definitely don’t need them. However, they are nice to have and since Benni and I really enjoy our Hubelino set, I am thinking about getting a starter set to get ahold of some of these “special” bricks. Hubelino seems great, I’ll show it to him maybe he will love the idea. Thank you for a great article.. I could not have found your site at a better time! My friends son is coming up to 3 and I was wondering what to get a 3 year old that is fun and educational. I think I am going to get him SmartMax Magnetic toy, I think even his dad may enjoy this! I love your site.. keep up the good work! My son is not young anymore but you have now made me want to go and buy Minecraft and the racing game. It’s always great to take some time and build something and then finish off the day with a little high intensity racing. These are some great ideas. Hey Rick 🙂 Thanks for sharing your thoughts! I totally get that: Whether it’s Lego or a Slot Racing Track! 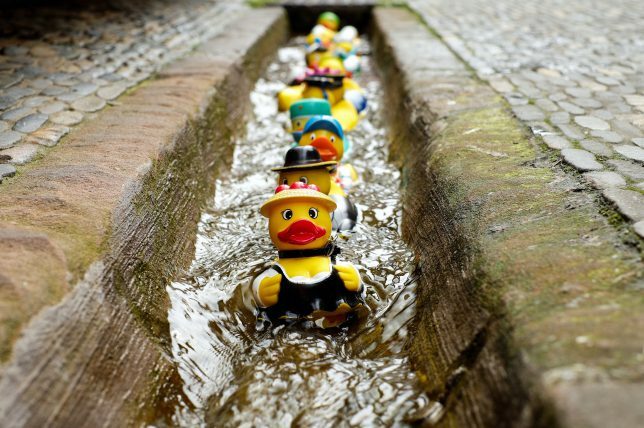 They’re great toys and you don’t have to be a child at all to have fun with them. Especially on X-mas, when the entire family comes together, there’s nothing better than some intense slot racing action with grandpa, me and Benni 🙂 It connects generations; give it a try, you’ll love it! This was perfect! I have 4 gkids, one on the way; ages 5-2. My 4 year old loves legos, by that I mean he loves for me to build and for him to tear apart. But he does not want either of his train tracks taken apart, nor does the the 5 year old. As a matter of fact, if you hear whinning, it’s because their younger sibling is doing exactly that. That said, Hubelino sounds awesome! Gotta have it. Thanks. Hey CT. 4 kids!!! That’s amazing. I admire you. You and your wife must be amazing parents!!! Benni being 3 years old now seems to slowly understand that building a Lego set takes some time and effort, and that ripping it apart isn’t the greatest thing you can do to the person who built it 🙂 I always try to build together him (let him pick the parts, lead his hand etc.) and maybe that helps him get a feeling for that. Lately he’s no longer all about ripping these sets apart but rather playing with them. And when he wants to play with one of my Lego Technic sets he even comes and asks if I could help him… That’s pretty awesome! Hubelino is great: Show it to your kids, I bet they’ll love the idea! Hi Chris, I haven’t seen some of these toys for ages. The train set and racing cars took me way back to when I was a kid. Those were great times that I had with my dad. The Lego and SmartMax Magnetic toys are not only fun but educational as well. They are excellent for developing the creative side of a child’s brain. Hey Brian, you’re totally right: Lego and SmartMax are excellent toys to teach and educate kids. I’m an engineer myself and I bet that Lego played a big role in getting me excited about technology and the like. Thanks for sharing your thoughts! Wow, AnxietyPanda would sure have been one happy three year old with all of these amazing toys! AnxietyPanda especially likes the lego sets xD and the Hubelino looks amazing and like it will provide hours and hours of pandalicious entertainment!